Artist’s concept of NASA’s New Horizons spacecraft as it passes Pluto and Pluto’s largest moon, Charon, in July 2015. After a voyage of more than 3 billion miles, NASA’s New Horizons spacecraft is ready to begin exploring Pluto. NASA’s New Horizons spacecraft recently began its long-awaited, historic encounter with Pluto. The spacecraft is entering the first of several approach phases that culminate July 14 with the first close-up flyby of the dwarf planet, 4.67 billion miles (7.5 billion kilometers) from Earth. The fastest spacecraft when it was launched, New Horizons lifted off in January 2006. It awoke from its final hibernation period last month after a voyage of more than 3 billion miles, and will soon pass close to Pluto, inside the orbits of its five known moons. In preparation for the close encounter, the mission’s science, engineering and spacecraft operations teams configured the piano-sized probe for distant observations of the Pluto system that start Sunday, Jan. 25 with a long-range photo shoot. The images captured by New Horizons’ telescopic Long-Range Reconnaissance Imager (LORRI) will give mission scientists a continually improving look at the dynamics of Pluto’s moons. The images also will play a critical role in navigating the spacecraft as it covers the remaining 135 million miles (220 million kilometers) to Pluto. “We’ve completed the longest journey any spacecraft has flown from Earth to reach its primary target, and we are ready to begin exploring,” said Alan Stern, New Horizons principal investigator from Southwest Research Institute in Boulder, Colorado. LORRI will take hundreds of pictures of Pluto over the next few months to refine current estimates of the distance between the spacecraft and the dwarf planet. Though the Pluto system will resemble little more than bright dots in the camera’s view until May, mission navigators will use the data to design course-correction maneuvers to aim the spacecraft toward its target point this summer. The first such maneuver could occur as early as March. 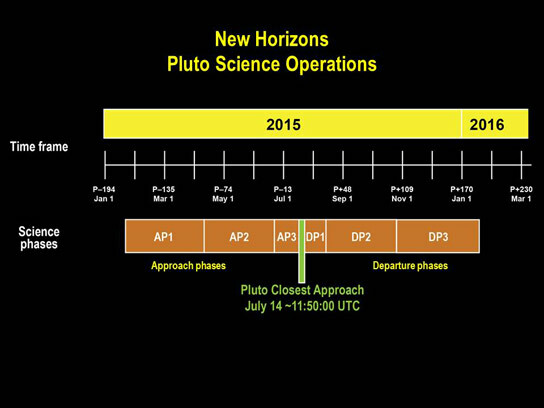 Timeline of the approach and departure phases — surrounding close approach on July 14, 2015 — of the New Horizons Pluto encounter. The “optical navigation” campaign that begins this month marks the first time pictures from New Horizons will be used to help pinpoint Pluto’s location. 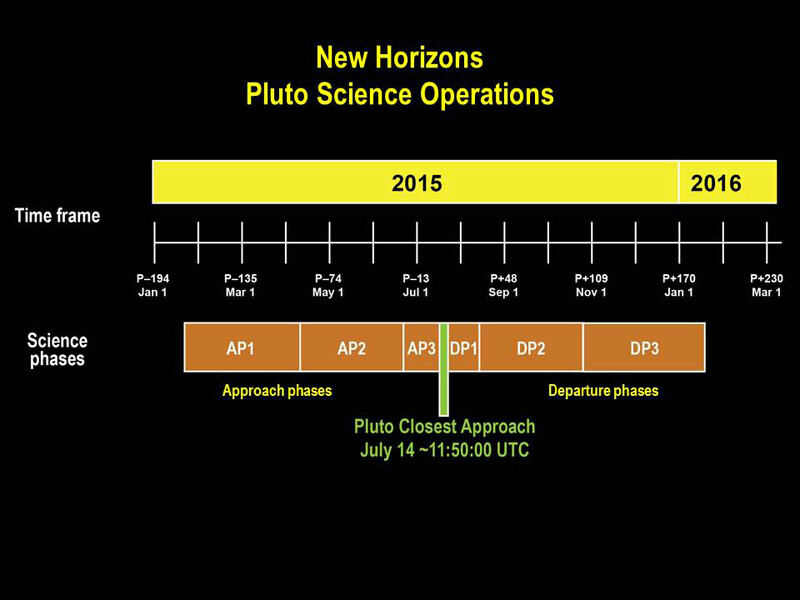 Throughout the first approach phase, which runs until spring, New Horizons will conduct a significant amount of additional science. Spacecraft instruments will gather continuous data on the interplanetary environment where the planetary system orbits, including measurements of the high-energy particles streaming from the sun and dust-particle concentrations in the inner reaches of the Kuiper Belt. In addition to Pluto, this area, the unexplored outer region of the solar system, potentially includes thousands of similar icy, rocky small planets. More intensive studies of Pluto begin in the spring, when the cameras and spectrometers aboard New Horizons will be able to provide image resolutions higher than the most powerful telescopes on Earth. Eventually, the spacecraft will obtain images good enough to map Pluto and its moons more accurately than achieved by previous planetary reconnaissance missions. APL manages the New Horizons mission for NASA’s Science Mission Directorate in Washington. Alan Stern, of the Southwest Research Institute (SwRI), headquartered in San Antonio, is the principal investigator and leads the mission. SwRI leads the science team, payload operations, and encounter science planning. New Horizons is part of the New Frontiers Program managed by NASA’s Marshall Space Flight Center in Huntsville, Alabama. APL designed, built and operates the spacecraft. 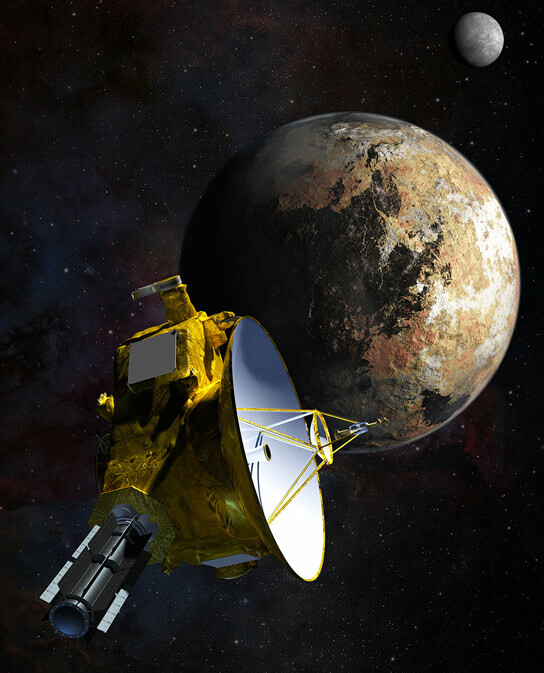 Be the first to comment on "New Horizons Begins First Stages of Pluto Encounter"